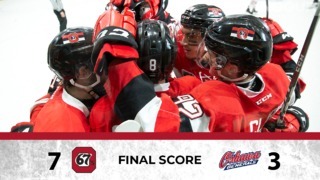 Following a perfect two-win weekend, the Ottawa 67’s will try to stretch their winning streak at home on Wednesday when they host the Kingston Frontenacs for the first meeting of the year between the two sides. Last weekend, Ottawa defeated Barrie 4-3 in a heated Saturday matinee contest before dominating the Sault Ste. Marie Greyhounds on Sunday, a game they won 6-2. Quinn Yule, Austen Keating, Marco Rossi, Kody Clark all hit the target, while Tye Felhaber added two goals in the win. Rookie Marco Rossi had to wait until his 7th OHL game to score his first career goal, but the Austrian is now off to the races as he has put up three goals in his last two games. 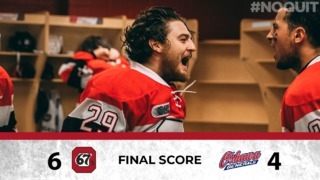 67’s fans will be hoping to see more of what the Barber Poles showed them over the past weekend in this always anticipated contest against the Frontenacs. After a deep run in the 2018 OHL playoffs, Kingston lost a few key players during the offseason. Those players, such as Gabriel Vilardi, Max Jones, Sean Day and Cliff Pu, were all acquired last year by the Frontenacs, who were trying to load up for a championship. This season, the Fronts have a whole new look with a much younger lineup that counts on 6 rookies. 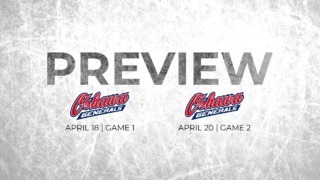 Currently on athree-game losing streak, the Frontenacs are looking for their first win in October as they visit the 67’s Wednesday night. A player to watch for Kingston is 2017 Dallas Stars’ second round pick Jason Robertson, who has put up a league-leading 8 goals in 7 games so far this year. The 67’s are counting on two players who are among the leagues’ top 10 scorers. Austen Keating is currently the OHL’s 3rd leading scorer with 13 points (3 goals, 10 assists) and Tye Felhaber is sitting in 6th with 11 points (7 goals, 4 assists). The Frontenacs have on their roster the leagues’ top goal scorer Jason Robertson, who has scored 8 times this season. Felhaber is 2nd in that category with 7. Felhaber is currently on a 5-game point streak. During those 5 games, he has put up 6 goals and 2 assists. Marco Rossi is currently second in scoring for OHL rookies with 6 points (3 goals, 3 assists). Tye Felhaber had three points on Sunday and he appeared in his 250th OHL game last Saturday.